There was only one serious question this week: Can Murray get the big win? Yes. It was a team effort and he got it. Before you go all 'yeah, but' ask yourself if you blame the QB when we lose regardless of his effort. If the answer is yes, you have to say he won this one. After all, the media has been praising Driskel for winning, when really if has been Florida's defense (which is to be credited for making Murray's life tough yesterday) carrying the Gators. You can find plenty of praise to go around, but I'll start with congratulating Murray for beating the Gators. It is a huge win. I refuse to blame Murray for the first two picks. Yes, he threw them, but they were balls that deflected off of receivers' hands. That third one, yeah, all on him. He made plays when he needed to and didn't lose his head after all the ints and drops. Kudos to Murray and the entire team, 2 in a row, baby! Agreed. We also need to reflect on the fact that Murray has beaten the Gators 2 out of 3 times. Regardless of his stats, who was the last GA QB to do that? He was 4 out of 6 on the last TD drive with the game on the line despite a tough day and incredible pressure. Maybe he grew up a lot then.Doesn't mean a thing though if we don't win out! Focus this week and fans be ready to rumble!!!! I'll give Murray credit for composing himself in the 2nd half, but all three picks were on Murray. The first one was a horrible decision(3 Gators blanketing the UGA receiver), the 2nd one was a forced side-armed throw and not put in the right place for the WR to catch it and the 3rd was just a terrible, panicked throw. We're all thankful for Jarvis Jones, but Murray should be more thankful than anyone. Jarvis has almost single-handedly changed the course of the series the past two years. The lead on the ESPN blog about the game:"Your team is leading its biggest rival 10-9 in the fourth quarter and your quarterback is in the middle of one of the worst games of his career. 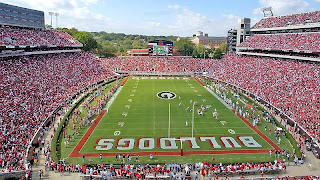 What is the smart play for Georgia's coaching staff in such a situation?" I like Aaron Murray a lot but I think he is still looking for his so called signature win. I do think the defense picked up their signature win though.